Dark and light colored chia seeds in wooden spoon. Seeds blurred in foreground and background. Chia is an edible seed that comes from the desert plant Salvia hispanica, grown in Mexico dating back to Mayan and Aztec cultures. 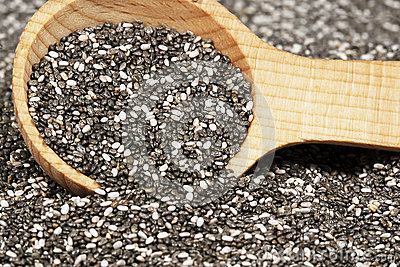 Chia means strength, and folklore has it that these cultures used the tiny black and white seeds as an energy booster. Chia seeds are a concentrated food containing healthy omega-3 fatty acids, carbohydrates, protein, fiber, antioxidants, and calcium. Healthy oats balls with chia seeds and coconut toppings. Red apple and Healthy vanilla pudding of a chia in a glass with granoly and mango. Healthy food. Chia seeds and oat flakes in water, with banana slices arranged in smiley face on a white plate.